Waterfall cards are super fun interactive cards and recently I made quite a few with matching post it note holders.The photos show the flipping panels of our waterfall card. 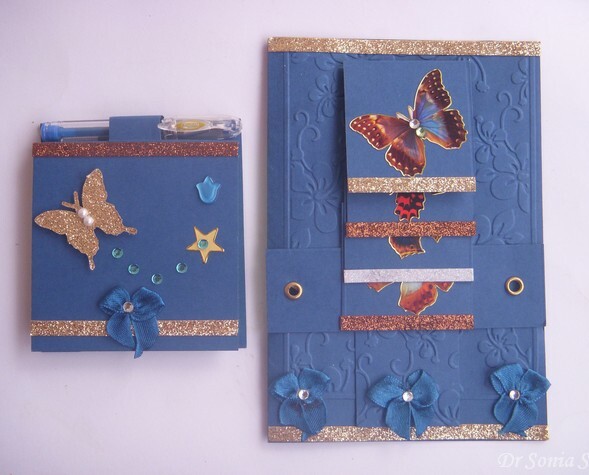 I had fun using butterfly stickers on the 2 inch square flipping panels of this waterfall card. 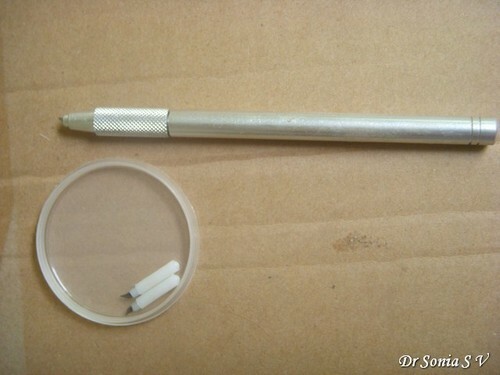 The photo shows the matching 3 x 3 inch pen with post it note holder. Though I love making all kinds of interactive cards ,waterfall cards seemed complicated.I couldnt quite understand the tutorials on the net and I couldn't even fathom the name waterfall as the panels actually flip up on pulling the tab [how crazy it would be if a waterfall defied gravity like that! 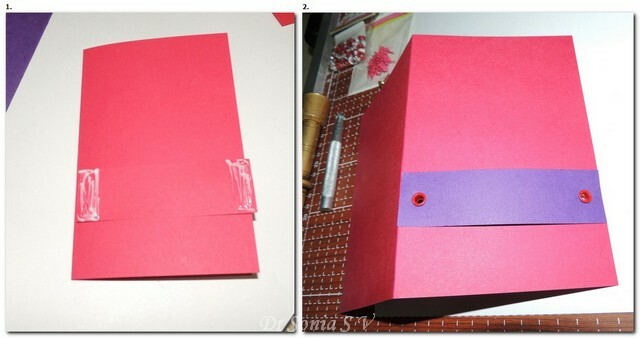 ].Also the tutorials on the net seemed to require a lot of card stock! 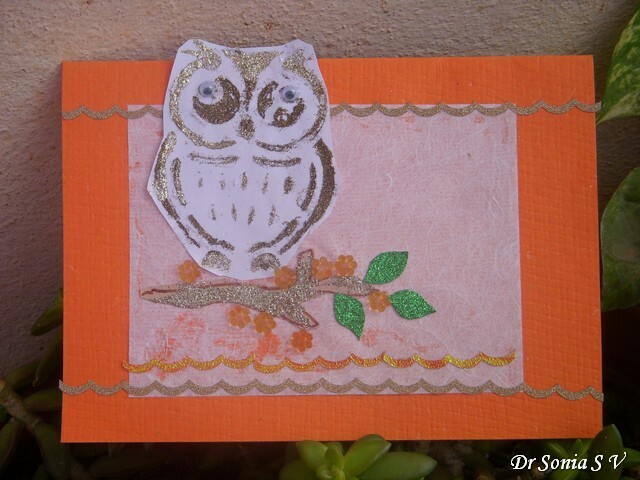 As paper-crafters we all love to "save" our precious card stock don't we? So the fun "paper saving" aspect about this tutorial is you can make a waterfall card using just a single sheet of A 4 card-stock and once you get the hang of it ,it saves time too! What is a waterfall card? 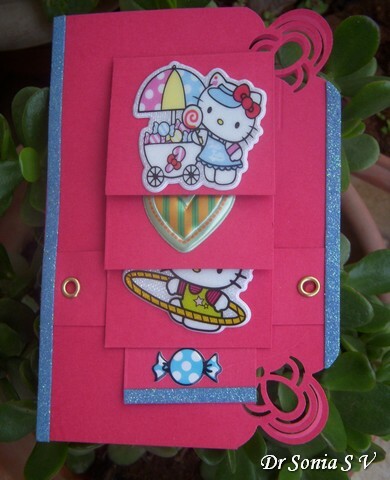 For my crafting friends who are not familiar with a waterfall card its a beautiful interactive card which looks way more complicated than it is!! Stick card panels on to a folded card strip and your waterfall strip is ready. 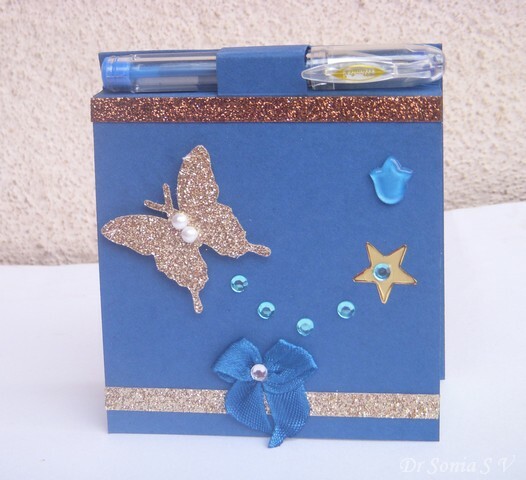 Use a belt type card strip to anchor it to a card base and your waterfall is ready to flip! Score and fold the interactive strip .Cut the panel strip into 4 panels at approx 2 inch intervals[the Panel strip is 8.25 x 2 which when cut gives 3 panels of 2 x 2 inch and one last panel 2.25 x 2 inch..if you want you can shorten this odd one to 2 x 2 or leave it as such ].By this method you utilize just one A 4 card to make the waterfall and only waste a small strip of card marked "cut off" from the belt strip. 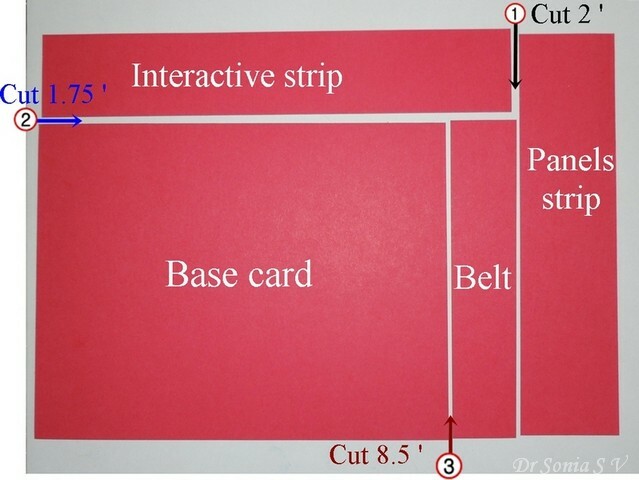 Take the interactive strip [9.5 x 1.75 inches] and score at 2 inches,2.75,3.5 and 4.25 [ie 0.75 inches gap]. Fold both ways at the creases to loosen the score lines. Fold over the strip as shown[ at the last score line towards the center of the strip]. Apply glue on the 2 inch wide area of the interactive strip as shown.Glue one card panel [I choose my odd size one which is longer than the rest] on it aligning the top of the panel to the score line. Apply glue to the area before the next score line and glue on the next panel again aligning the top of the panel with the scoreline.Similarly glue on the other 2 panels of the waterfall card. 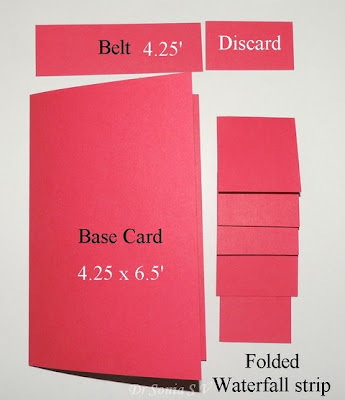 Attach the belt strip to the lower part of your base card using strong white glue at the edges[ around 0.5 inches area] or brads or eyelets.The belt attachment needs to be sturdy yet loose to allow easy flipping of your waterfall card. Slip in the folded waterfall strip under the belt keeping the part with the panels above the belt. 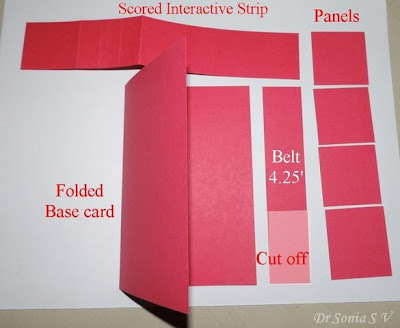 Apply glue on the central part of the strip which will be covered by the panels.Stick on the panel which overlaps the belt aligning the lower border of the panel to the lower border of the belt.Allow it to dry well and pull the interactive strip to see your flipping waterfall card. Well for those of you who have never made a water falI card it may sound complicated..but do give it a shot and I bet you will be hooked ! 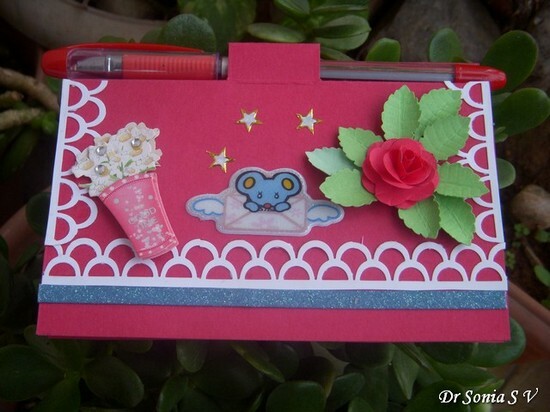 And I do hope this crazy tutorial is of help..to my fellow crafters in some way. Basic Scissors: For basic crafting needs any good locally available brand would do. 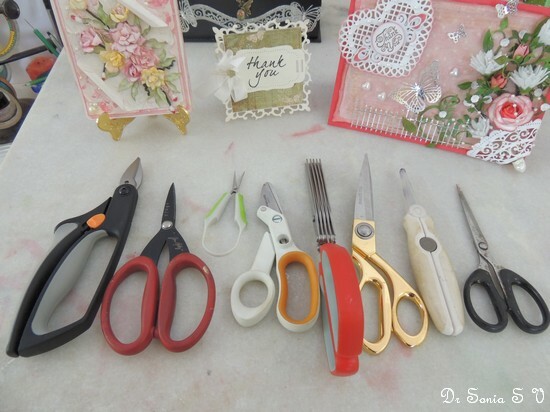 Over time I have a huge collected many scissors[ updated this scissors picture on Jan 2015!] A good locally available brand is Cartini. Cons: Cutting perfect straight lines requires a bit of care! If you have to do loads of cutting it will take its toll on you! 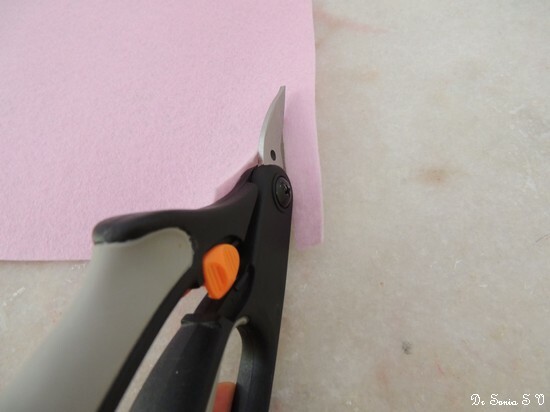 Tip:Avoid using your paper crafting scissors for other purposes such as cutting fabric. 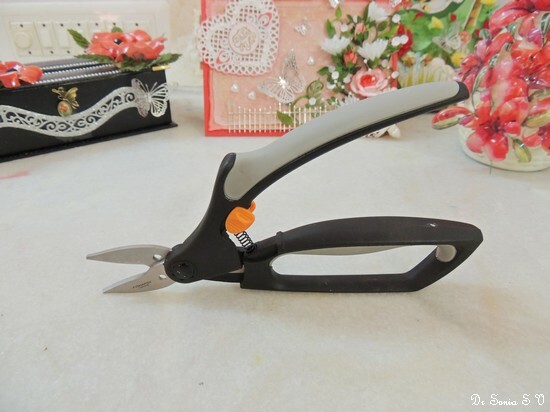 The Fiskars Hobby Snip is a big strong fellow with so many clever features! Hole for dowel/ wire cutting - awesome feature- see later in the post! Spring Action - means less aching hands while cutting! 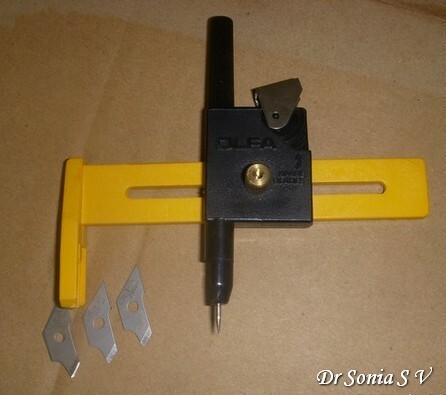 Easy lock which can be operated using your thumb! 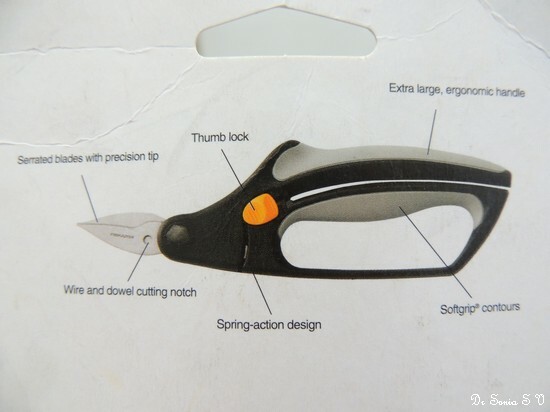 I 'll first show you my most favorite feature of this scissors - do you see that funny looking hole in the scissors blades? 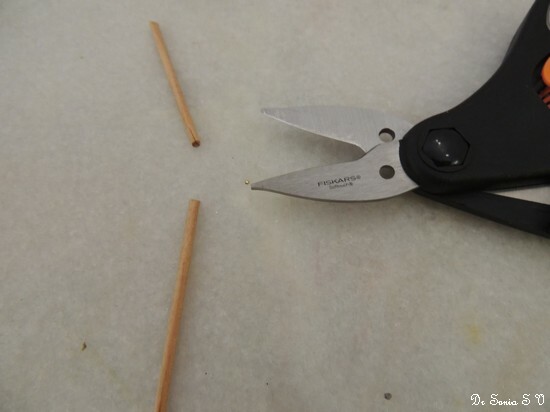 Those are meant for cutting wooden skewers and wire! Both the Tim Holtz and the Fiskars Amplify scissors can cut card board but how about if you want to keep on cutting card board / chipboard for hours together...the Fiskars Hobby Snip is the one you get because as it has a spring action...after each cut the blades spring apart and your hands wont ache even with this heavy duty cutting!! And the spring action makes even fringing thin cardboard a breeze! and the spring action makes fringing felt ..easy peasy! Yes you can roll these up to make fringed felt flowers like you would paper quilled fringed flowers! And here is one more unique feature of the scissors - it has an absolutely flat lower handle surface and you can make it stand on a flat surface while cutting something lengthy like fabric or chart paper! And because of its spring action this baby even has an Arthritis Foundation Ease of Use Seal!! 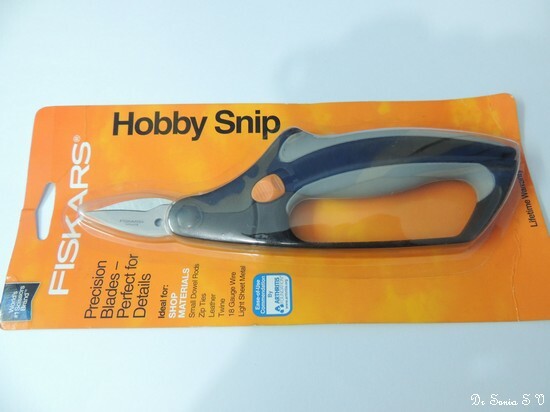 Criticism of the Fiskars Hobby Snip : I am totally in love with this one so no you are not going to hear a word against it from me!Ha Ha! 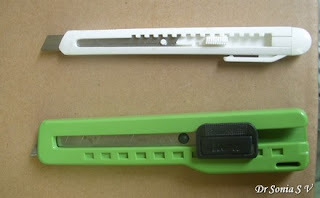 Fancy border scissors: are available in many stationary shops the popular ones being zig- zag, wavy, scallop etc. 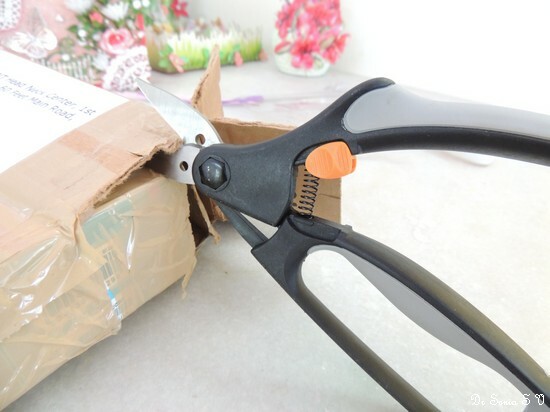 Have tried these fancy border scissors from several companies but I don’t relish working with them as I feel they require quite a lot of effort to create decent patterns! Cons: They require quite a lot of effort to create decent patterns and most of the brands available locally don’t cut as smoothly as you would want them to! Pros: A fun fancy tool to have in your armamentaria. The local one is not expensive costing Rs 300 only [ref Sudha].Making fringed flowers would be so easy with this. Cons: Consider whether you will be using it that much and if you are a dedicated quiller you may even want to invest in the more expensive fringing machine. 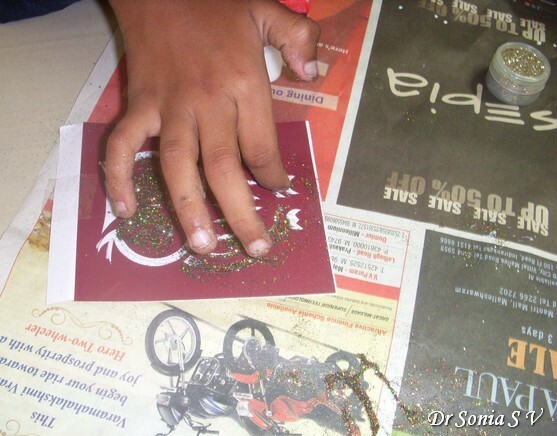 Small tip scissors: Though there are many expensive craft scissors, a cuticle scissors is just great for this purpose. 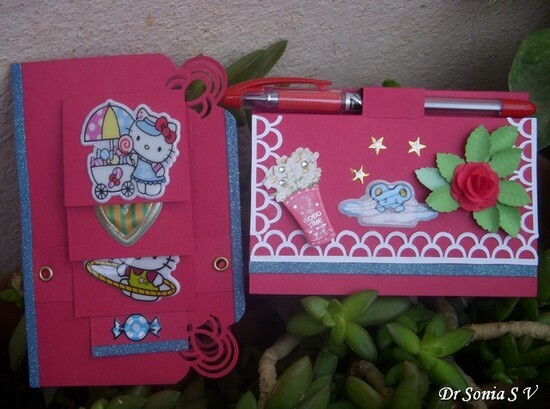 If you love quilling, kirigami, 3D decoupage and fine paper crafting these may come in handy. Though I do lots of fine cutting [in origami architecture and kirigami pop up cards] I don’t use small scissors for the simple reason that they get misplaced so fast in our household and I would have to hunt boxes of toys and junk to retrieve it! Pros: helps snip off the teeny paper bits and corners. Not expensive so worth investing. Scissors to cut double sided foam tape and sticky tape: If you have ever used double sided foam tape you will realize how sticky your scissors becomes on cutting it so it’s an absolute must to keep a separate scissors to cut those sticky double sided foam tapes.An old scissors would work well for this purpose. Another awesome alternative is a nonsticky scissors such as the Tim Holtz Tonic Scissors which is such a beauty as it doesnt get sticky after hours of sticky tape cutting ! These are amazing to use…you just press the lever down and the paper will cut though like magic! Tips to consider while buying: Chose the size and brand wisely and do test it out! 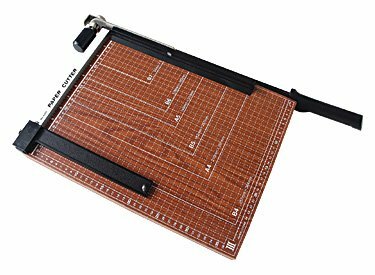 I initially bought a 14 cm x local brand Taj guillotine costing around 700 rupees…it cuts well but I faced difficulties in cutting large chart paper for my daughters school projects so later on invested in a larger one by brand Deli . 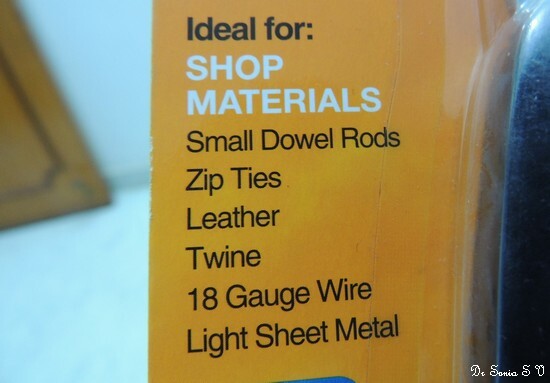 Pros: Comparatively inexpensive as locally manufactured. Smaller ones cost less than 500 rupees. 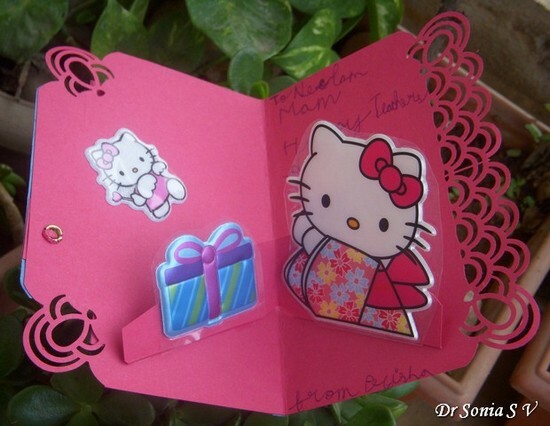 It cut handmade paper, thin paper, origami paper and card stock easily. Sharp cutting blade needs no replacement…the vendor said like a knife you can sharpen it if it blunts over time. Mine has been subjected to heavy use more than a year and still cuts perfectly. Cons: Very heavy and bulky as made of metal completely. Take care if kids and pets are around as the blade is exposed. In the Taj Model the paper has to be placed below a plastic platform and I couldn’t place thick foam or cardboard under it. If I put the thick material over it and tried cutting the edges would be extremely jagged! Pros: Available in India in major stationary shops such as Staples and even your local stationary shop may be able to procure one for you. Cutting is a breeze. Easily cuts foam and even thick cardboard. Big help is the detailed measurement markings on the platform as well as the top shelf. Markings are in both centimeters and inches. Cutting is easy, fast and clean. Less expensive compared to the paper trimmers. Sturdy and strong as made of wood or metal. Advantage over paper shredder is that you can cut your strips wider than in the paper shredder. Most are bulky and heavy so difficult to carry around. You cannot cut a slit in the middle of the paper like in fancy paper trimmers. I don’t know of any guillotine cutter which cuts a fancy border. 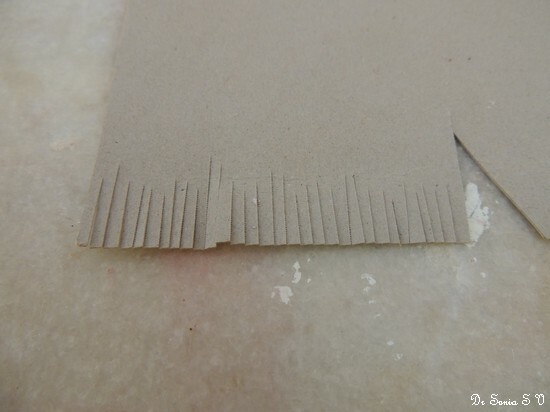 For paper strip cutting for quilling you need to cut each individual paper strip and won’t be able to shred a paper into strips as quickly as in a paper shredder. There are many brands available both online and at local stores. 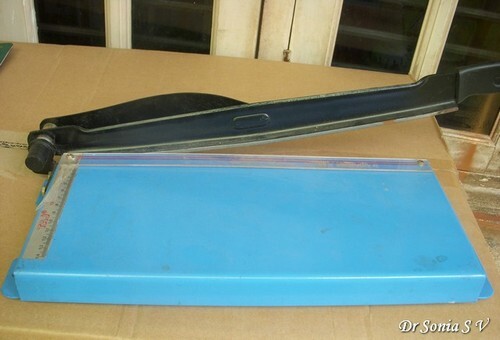 They have small blades which slide across and cut your paper…a proper fancy tool to own! Pros: Depending on the brand you may have options to cut fancy borders, cut a slit in the middle of the paper or even score the paper. Light weight so easy to carry around. Cons: The biggest negative of these for me personally was that they need replacement blades and if you are buying them online you have to keep in mind the availability of the blades too! A bit of online research with price and feature comparison is required to find the right one for your needs! This is one tool which will give quality cutting even with the cheap variety!! I use the craft knife for kirigami, origami architecture projects, pop up cards and 3 D paper crafts. I buy the 10 rupee variety and am fine with it! Have tried expensive versions but the blades need replacement no matter which brand you use so you might as well go with the cheaper version! Pros: Cheap. Easily Available. Common brands come with “break off” spare blades. Cons: You need a cutting mat or the kitchen cutting board to lay your paper on so that the knife doesn’t cut through and leave marks. 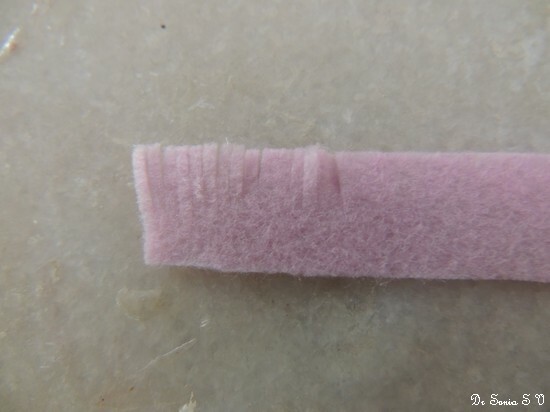 The blades blunt fast and if you cut with a blunt blade you get ugly jagged edges and even torn paper. Breaking off the blades when they blunt is not something I relish doing as snapping them off is often not easy as it looks! Edited: Tejal shares that the Camel brand craft knife blade stays sharp for long…I have to go hunt for it! I bought this knife as part of a Cut N Tuck kit by Shilpi Company. It’s available for sale individually too and many craft shops will sell the knife as part of the set. Pros: Very fine knife suitable for delicate cutting. 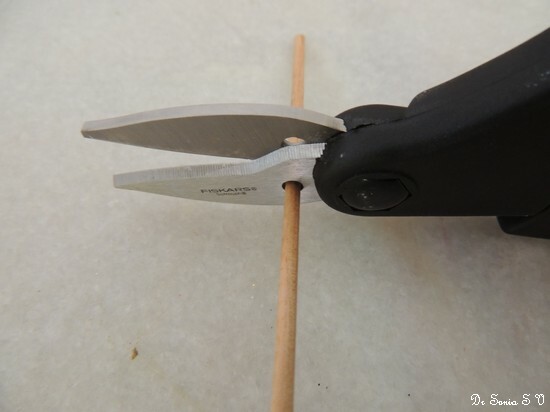 Cut N Tuck templates cut best with this swivel knife. The blades are not easily available to buy and are comparatively expensive too. Apart from Cut N tuck projects I do not really relish using this delicate knife! 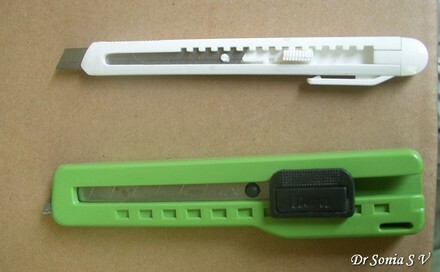 These are fun tools which can cut a paper strip into perfectly even fringes in no time at all! 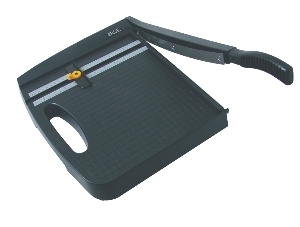 It’s a cleverly designed machine which feeds a paper strip into a mini guillotine which cuts the paper strip into fringes on an up and down motion of a lever. 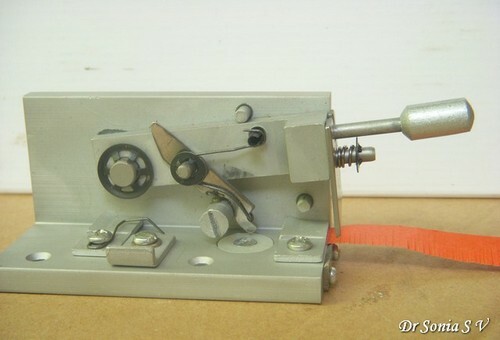 There are 2 types of fringing machines available: one cut at 90 degrees and one cuts at an angle. Pros: Fringing paper using the normal scissors is time consuming and you need to have a knack to cut your fringes evenly spaced. The machine works like clockwork to cut a paper strip into beautiful even fringes. The fringed flowers made using the machine fringed strips have a professional look as the cuts are so fine and even! 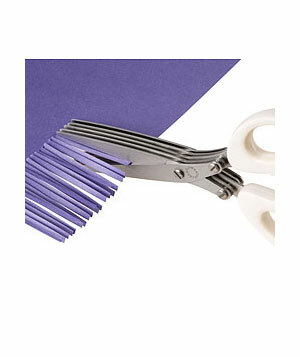 The less expensive fringing scissors is more versatile as the paper width will not be a restrictive factor! You have to get into the knack of using the machine and if you are a bit careless with the up and down lever movement the paper gets cut through instead of being fringed! You have to test it before buying as I found one at a reputed craft store which would not cut properly at all! In the end you might as well take out the scissors and fringe your paper in the usual way as a bit of imperfection in the fringing may not matter to you! Cons: You need to buy online or from a dedicated craft shop which imports it as not easily available in Indian stationary shops. Blades need replacing. Tips before buying: If you have a die cutting machine with circle dies that may work for small to large circles and if you want to cut small circles the circle punch is an easier and cheaper option! 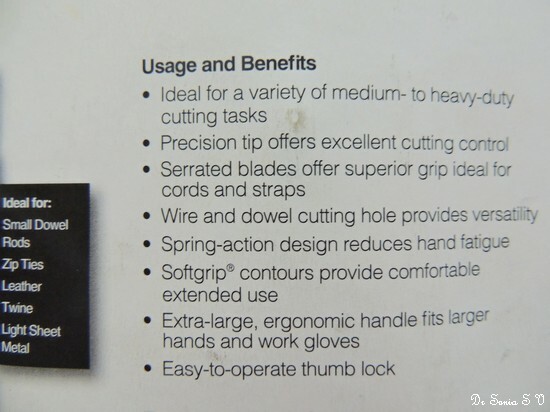 And do consider how frequently and how much you need to cut circles before splurging on this fancy tool! Cons: Not very easy to use. 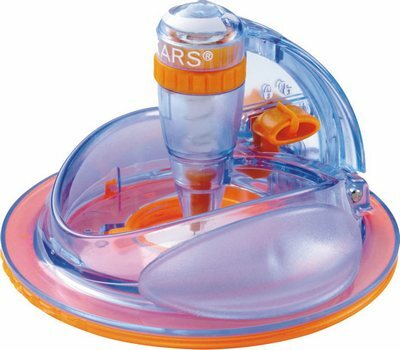 I bought one ages back but found that simply cutting a circle with the scissors was easier than using this! I would not advise to let your KIDS use it as its difficult to handle!! Blades need to be replaced and though the Olfa brand comes with a couple of spare blades , the blades are not easily available to buy! 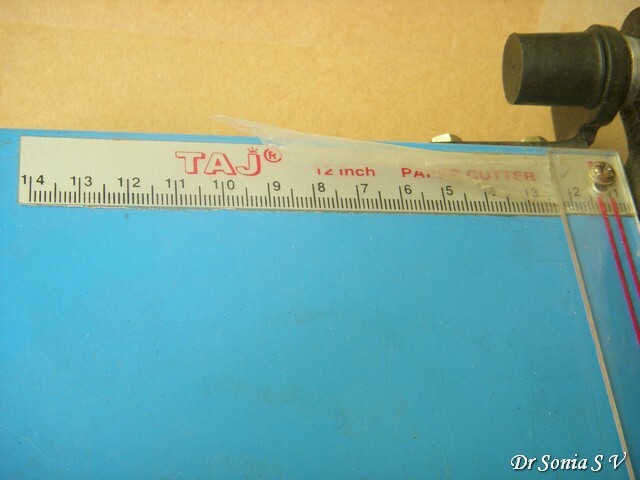 The Jef shape cutters come in huge nesting templates of a particular shape. 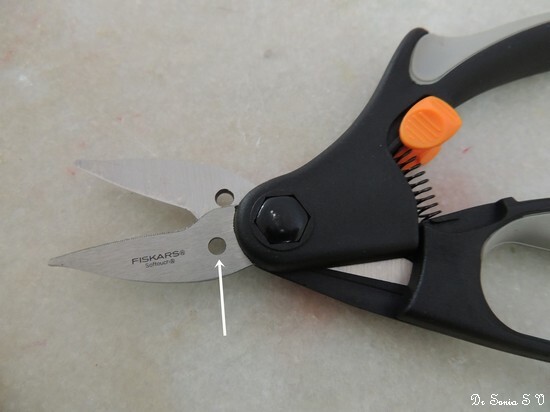 The Fiskars shape cutters are smaller and different shapes come in a packet. Pros: Would be fun to just slide the blade and cut out shapes! Cons: Needs replacement blades which are not easy to get in India. The shop I saw the shape cutters in didn’t stock the replacement blades and though I was really tempted to buy I did not in the end! 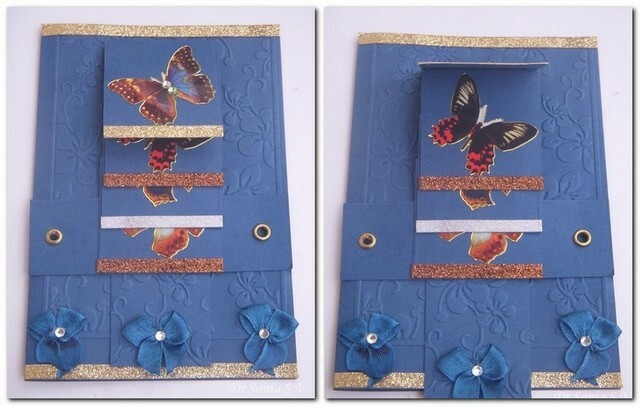 Paper shredders are quite in demand these days by the paper crafters especially those who enjoy quilling. 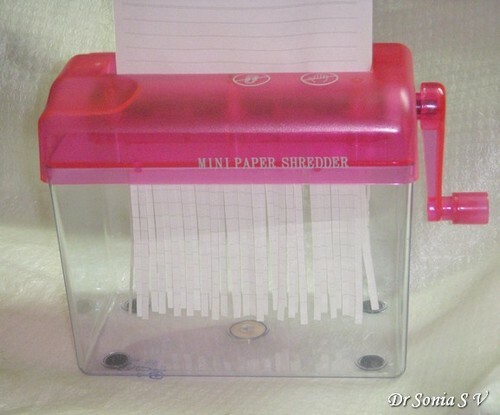 Paper shredder can shred paper into tiny bits or into strips. 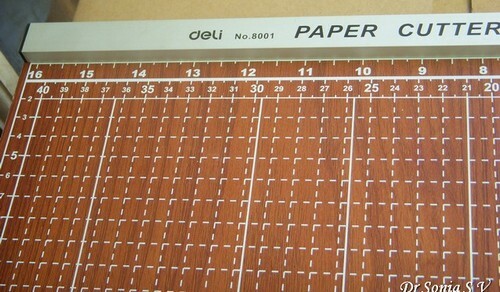 The type which shreds paper into strips is the variety popular with paper crafters. Hand shredders are available in the Indian market costing 500-1000 rupees. Battery operated or electrical shredders can be bought from stationary shops such as Reliance and Staples but are more expensive and may not be necessary for crafting purposes. Pros: Works out more economic than buying quilling strips. Much faster than using a paper cutter or hand cutting—using a shredder you can create paper strips from an entire A 4 paper in seconds! 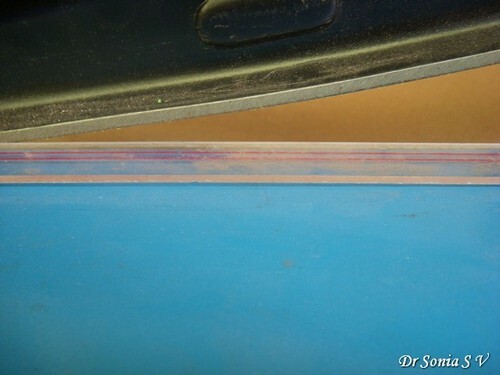 Cons: The paper strip width is a standard 3 mm and so you are limited by the paper strip width. The edges have a mild wavy texture which you may not like for some projects though I personally love the appearance of it! Not worth buying if you don’t quill loads of stuff! Dear friends sorry I have not been to visit your blogs, my little one has school holidays due to a bus strike and I am struggling to balance work and motherhood ! Tape the Stencil on paper using a sticky tape that is not too sticky so that you wont tear the paper later on when you remove it from the stencil . Let dog help [to prevent doggy -sad face]! Let your child smear glitter on the stencil alone and not her face or the dog! 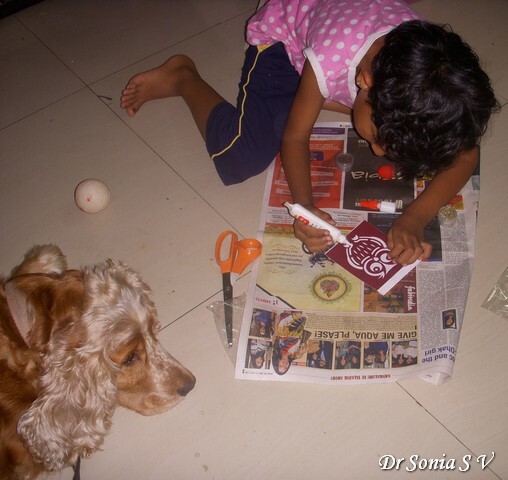 Try to avoid thinking how you are going to clean up dog, child and house ! Try to be graceful when your young crafter rejects all your "creative input" and still makes a beautiful creation !! Dear friends Thank You for reading through all that !! 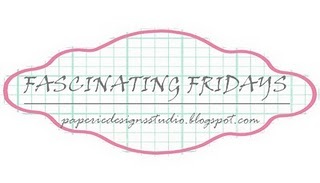 And to help me feel better I am going to head out to Noor's Paperie Designs where Hussena has featured me in the series called "Fascinating Fridays" !! Thank You Thank You ..such a morale boost for me!! 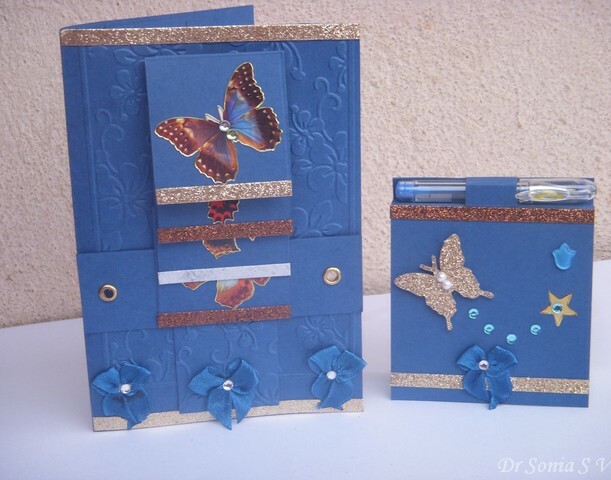 I love making cards with all kinds of interactive movements such as spinning cards, swinging cards, pop up cards, sliding cards,wiper cards,shaker cards and crazy cards with combinations of all these mechanisms. 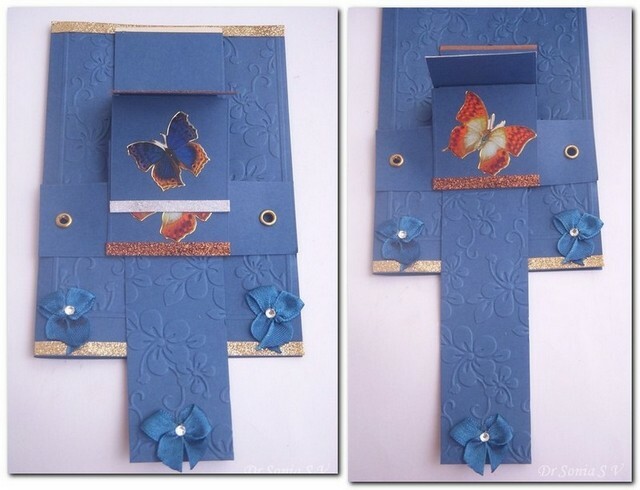 We combined a waterfall card with a simple pop up mechanism in this teacher's day card. You would have guessed who chose all the stickers on this teachers day card [I am actually glad my 6 year old chose " hello kitty" than Disney princesses this time- I am suffering from an overdose of sleeping beauty these days! 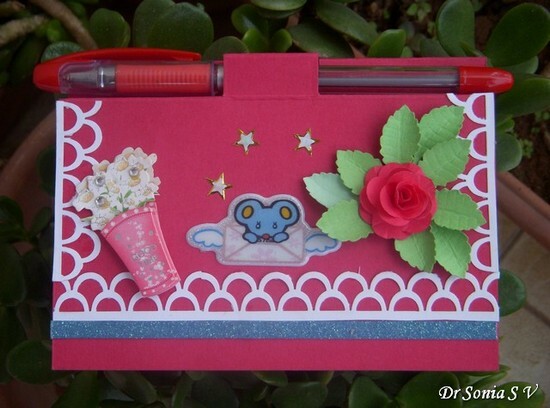 ].I made a punchcraft rose to embellish a matching post it note holder. These post it note holders are completely inspired by my blogger friend Nupur though I did have to scratch my head to figure out how to make them. from http://jessicascraftshaque.blogspot.in/ in the USA! Its quite amazing since I won my first ever blog candy from her and she is the winner of the first candy at my blog! Here is what I will be sending her. 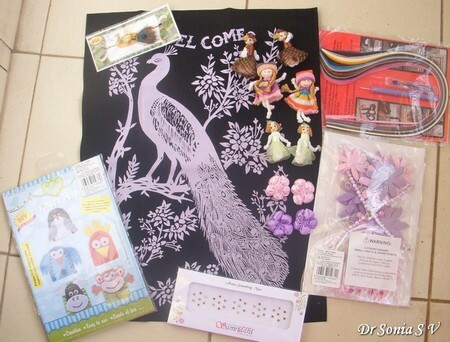 It includes a Peacock emboss painting kit,Flower and beads mobile making kit, Quilling kit, Finger puppet making kit,Puffy Fabric flowers, 6 little Dolls ,Peacock embellishment and rhinestones. I must confess when I realised Jessica was the winner I tweaked the gifts to include the emboss painting[for an Indian touch as its our national bird] and the finger puppets[ Jessica has 5 darling children]! I hope she likes it! !